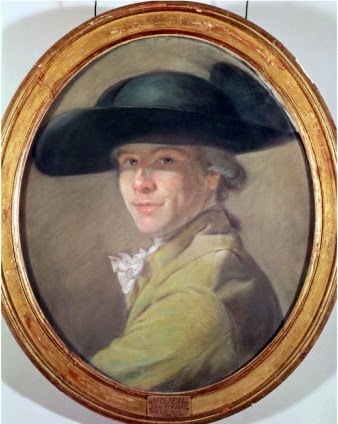 In 1775 the future Baron and director of the Louvre Dominique Vivant Denon was 28, the Patriarch of Ferney 81. Denon, who was the protegé of Vergennes, had been sent to Geneva on a diplomatic mission, probably to consolidate the French alliance with the Swiss cantons. Naturally, on his return journey, he was eagar to stop of at Ferney; but Voltaire, whose hospitality had been taxed by a constant stream of visitors, was less than enthusiastic. 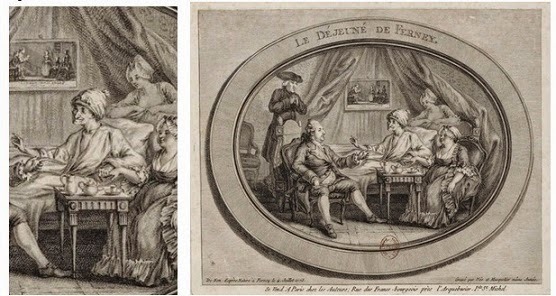 Denon was not to be thwarted; in a letter of 3rd July 1775 he claimed to quit understand Voltaire's wish to feign illness, but that he owed him indulgence as a fellow Gentilhomme ordinaire du roi and, what is more, a potential comrade. Voltaire's curiosity was evidently piqued by this studied impertinence and he agreed immediately to a visit, addressing his reply to "Monsieur mon respectable camarade". Most sources ascribe to Denon only a single visit, but his 19th-century biographer Albert de La Fizelière reported that Voltaire kept his guest an entire week, so diverted was he by the young man's stories of St. Petersburg and Paris. The two disagreed only about the character of the Russian Empress whom Vivant thought had only an "ordinary intelligence", though he gamely credited her with distinguished manners and breadth of vision. According to a letter of 5th July the quality of Voltaire's which most impressed Denon was his continued vivacity: "Your gaiety is a phenomenon that I cannot forget. You have shown me that time has no effect upon the soul when none of its wellsprings are allowed to dry up." Voltaire, for his part, thought Denon resembled his younger self, both physically, mentally and temperamentally. So far, so good. The rot only began to set in when Denon solicited a portrait of Voltaire for their mutual friend, the composer Benjamin de Laborde, who had written letters of introduction to Voltaire on his behalf (though they had arrived too late for his visit). Voltaire cast around for a suitable likeness to send, willfully disregarding Denon's hint that he himself wanted Voltaire to pose. Voltaire had probably forgotten all about the request when, five months later on 5th December 1775, Vivant Denon sent him an engraved portrait he had made, accompanied by a flattering letter. Voltaire took a fortnight to reply, and his verdict was hurtfully negative; Denon had turned him into "an atrophied monkey, with a bent head and one shoulder four times as high as the other" - a caricature he was sure his enemies would enjoy. On 26th January 1776 he accepted with good grace Vivant's assurance that he did not intend "a caricature after the amusing pieces of M.Huber" but annonced his intention to refer the work to a new favourite, the sculptor François-Marie Poncet who was staying at Ferney at the time. Poncet's comments survive among Denon's papers - the portrait is too mannered, Voltaire's shoulder too high, his nose too long, his mouth too round. One can well imagine Denon's irritation! It is in this same letter that Voltaire mentions for the first time a second engraving called "le Déjeuné de Ferney", which was doing the rounds in Paris, widely identified as "une plaisanterie de m.huber" and which had made him look thoroughly ridiculous. There is little doubt that Voltaire knew full well that this too was the work of Denon, though he clearly hadn't seen it at this time. An undated letter of the marquis de Villette noted the subsequent arrival of a copy at Ferney: Laborde, whom he thought to be the author, is depicted "in all his plenitude, beautiful as an angel", whereas Voltaire, in a corner, is "thin as death and as ugly as sin". Voltaire himself was said to have exclaimed, "It is Lazarus at the dinner of the rich man!". "It really grieves me that people are making you believe that I was thinking of rendering you ridiculous; this is to distort in your mind all the feelings which I genuinely have for you, and it is also degrading to my character. Eh! monsieur, why forever imagine enemies? Do triumphs merely augment our fears? What then is renown if terror continually resides within it?" Here is the offending engraving, which was produced by the firm of Née and Masquelier. Voltare is depicted in bed, laughing in mid-conversation, with a ridiculously plump Madame Denis holding his hand. (It was doubtless she who took greatest umbrage at the picture!) At the foot of the bed stands Voltaire's tame priest Father Adam and Agathe, Madame Denis's delectable chambermaid. The stout and indecorously seated figure in the foreground is Laborde. In 1911 Pedro Paullenot published an account of the original lead pencil and ink drawing which he had tracked down in the possession of a descendant of the lithographer Lafitte. It measured 13.7 cms by 10.5 cms, and was signed "De Non", described as "from nature" and dated 4th July 1775. A marginal note stated that Denon himself had given it to M.Lafitte, who had engraved a number of his designs, for example the frontispiece for Point de Lendemain (Didot 1812). Did Denon really intend to satirise his host? The jury is still out! Probably, he saw his work as amusing rather than malicious. Many of his creations verge on the caricature and doubtless he was led astray by the tempting contrast between the dessicated patriarch on the one hand and his absurdly round mistress and the well-padded Laborde on the other. Though not precisely "from life" - Laborde had not been present during Denon's visit - the composition reflects the informal quirkiness of Voltaire's domestic arrangements. 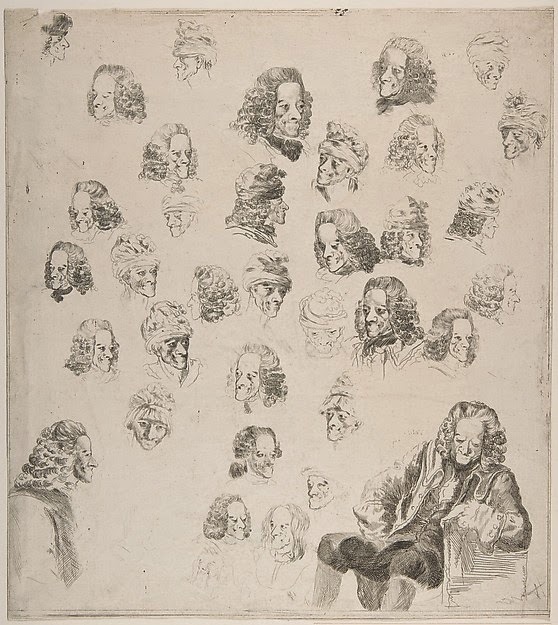 Denon later compounded his felony by producing several engravings featuring multiple heads of Voltaire "after Huber". 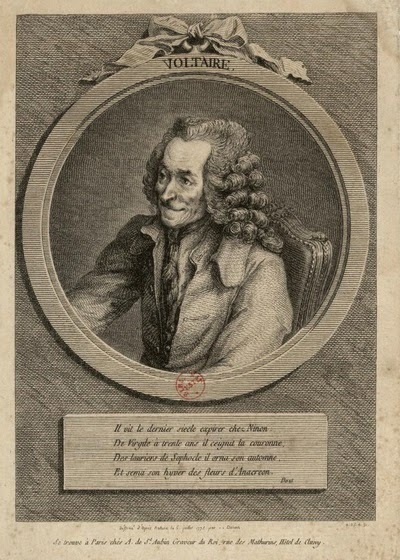 Laborde was clearly happy with his depiction since a second engraving by Denon, "Laborde à la lyre", was chosen as the frontispiece for his major work, a collection of songs. As to Denon's original portrait - it was good enough for the Banque de France and appeared almost unaltered on ten-franc "Voltaire" banknotes produced between 1963 and 1973. 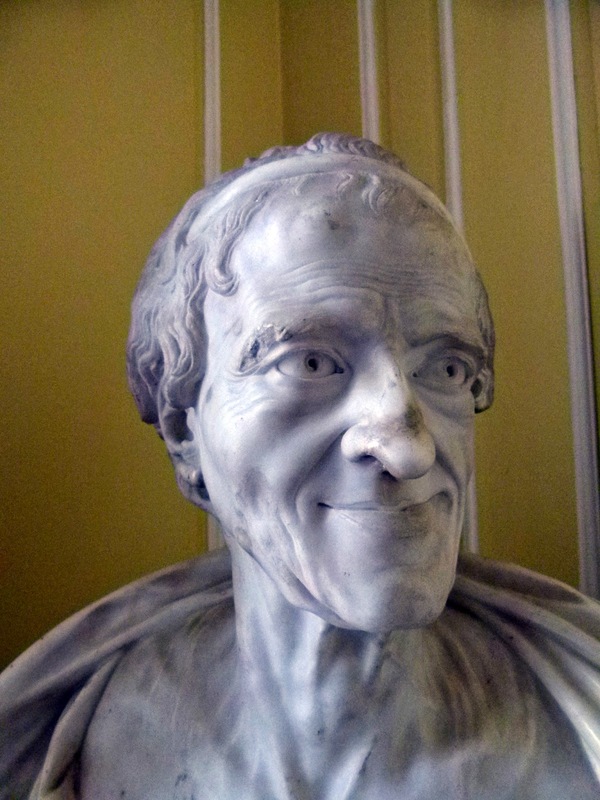 One might add that the esteemed Poncet did little better in depicting Voltaire - at least if the copy of his bust at Ferney is anything to go by! Denon told me his last visit to Voltaire was in 1776. He had been detained late at Geneva, and it was near midnight when he arrived at Ferney. He found the venerable patriarch sitting up to receive him, in that salon now so familiar to every English traveller. He was in high health and spirits; and after supper the two delightful raconteurs began to narrate - mutually excited, and mutually charmed. It was in vain that Madame Denis frequently came from her bed-room, in nightcap and slippers, to endeavour to get her uncle to bed. Voltaire, with the querulousness of a spoiled school-boy, resisting the similar attempt on the part of his nurse, pushed her away, with - "Mais allez donc - qu-est-ce que ça fait, si je m'amuse?"